By sending a “Wikirank beta release” email, Jeff Veen gave us nerds something else to do tonight besides see Watchmen. VentureBeat has a write-up and there’s a recent video of Veen talking at Startup2Startup. 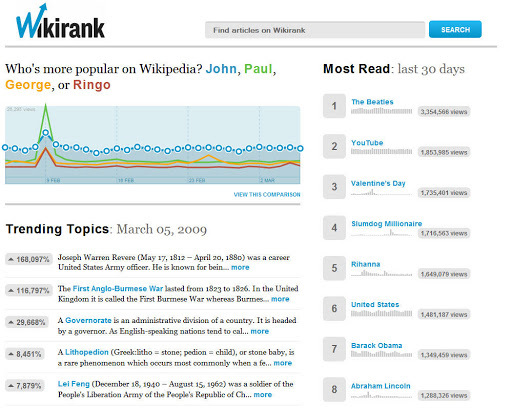 Now if you’ll excuse me, i need to go use Wikirank to conduct important research – namely investigating the popularity of various metal bands and 1980s wrestlers. This entry was posted in jeff veen, wikirank. Bookmark the permalink.